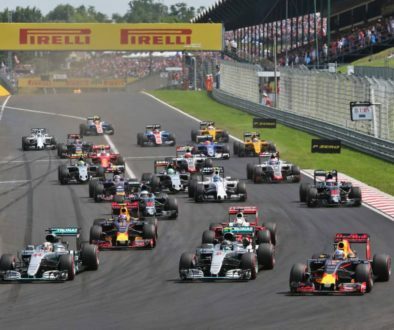 Following the German Grand Prix, its clear that the revival of two entities is complete. Firstly, Lewis Hamilton has been able to overturn a 43-point deficit into a 19-point lead over his teammate Nico Rosberg. Secondly, Red Bull who started the year with a seriously uncompetitive package has improved so much that they are clearly the second best team in F1 at the moment. Max Verstappen (NLD) Red Bull Racing RB12 at the start of the race. There is further synergy in that both Hamilton and Red Bull started their revival around the Spanish Grand Prix. 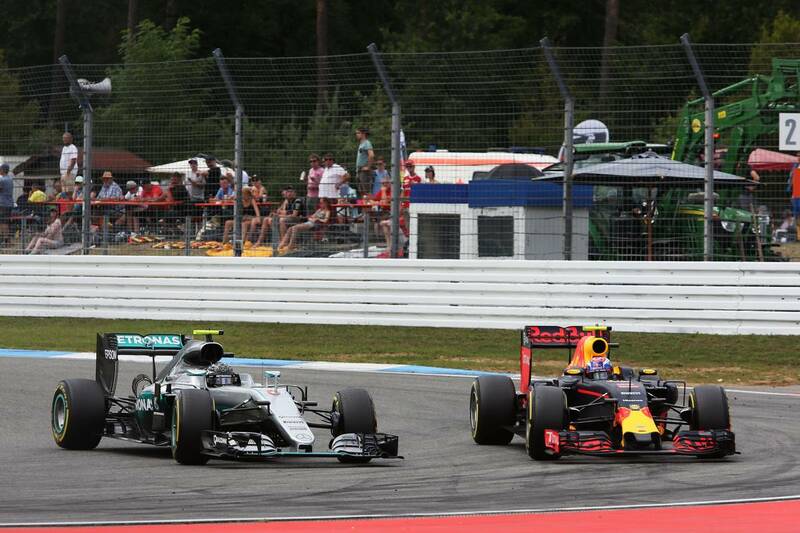 Since Hamilton’s collision with Rosberg he has out-pointed his teammate quite comprehensively. And of course the other beneficiary of that collision was Red Bull who took their first win of the season through Max Verstappen. It could have been so different for Rosberg on Sunday. He had done a seriously good job in qualifying to beat Hamilton to pole, which had set him up at the front of the grid on the all important clean side of the track. He just had to make a decent start to put himself into the lead and an excellent chance to win the race. Disastrously he didn’t, and probably had his worse start of the year to drop back to fourth. For me he was a little unlucky from then onwards. After the second round of stops Rosberg managed to make an excellent overtaking move on Verstappen to move up to second. I thought it a bold, hard, but fair move. Unfortunately the stewards didn’t view it my way and a five second penalty was the result. 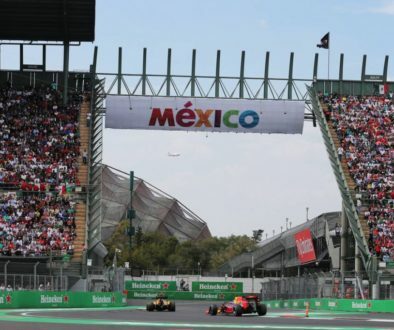 Rosberg fulfilled it at the next stop and instead of finishing second he dropped down to fourth. 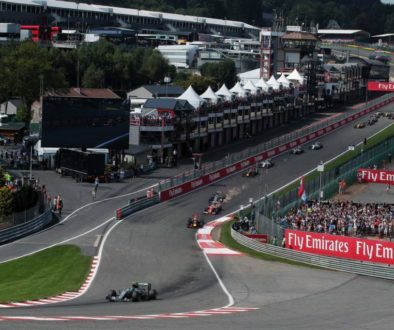 At the front, Hamilton was able to have a trouble free race to another easy (relatively) win. 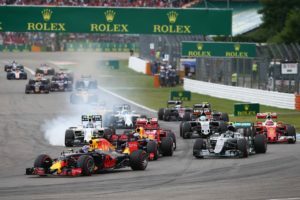 Ricciardo followed him home by only seven seconds – which is seriously impressive when you consider that Germany is a horse power track – with Verstappen in third. 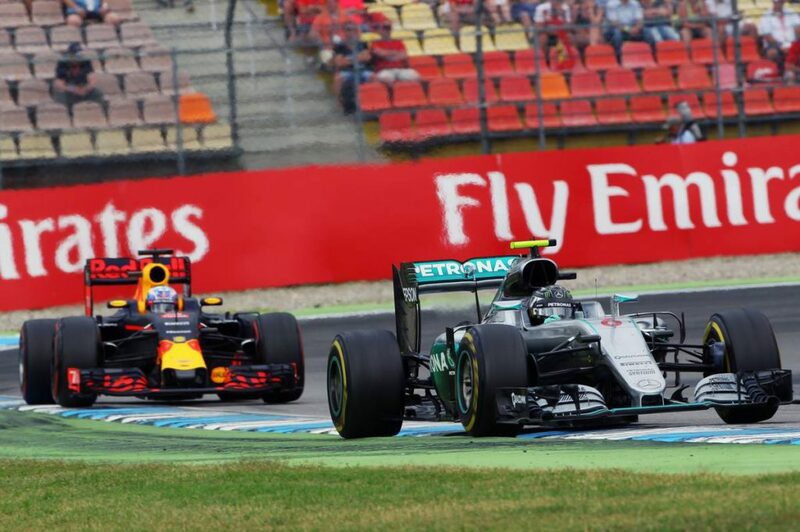 Nico Rosberg (GER) Mercedes AMG F1 W07 Hybrid and Max Verstappen (NLD) Red Bull Racing RB12 battle for position. On my drive back to KL from Singapore I’ve had time to reflect on the race a bit more and I’m starting to wonder if the two drivers leading the championship are the best drivers this year. 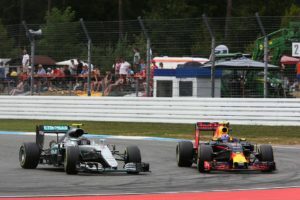 Hamilton and Rosberg have in affect only been racing each other over the last two and a half years due to the superiority of their Mercedes machinery. They have also been a little inconsistent this year, especially in comparison to 2014. I’m wondering if this intra team battle- where they pretty much only have to beat each other to win races- has made them a bit complacent? When I stack up their performances compared to the Red Bull drivers for example, who week in, week out have been driving the wheels off their cars, there may be something to it. Especially after Red Bull made that inspired choice to replace Kyvat with Verstappen. Since then their drivers have been pushing each other to new heights and I’m starting to think the boys in blue instead of the guys in silver are the best performing driver pairing this year. 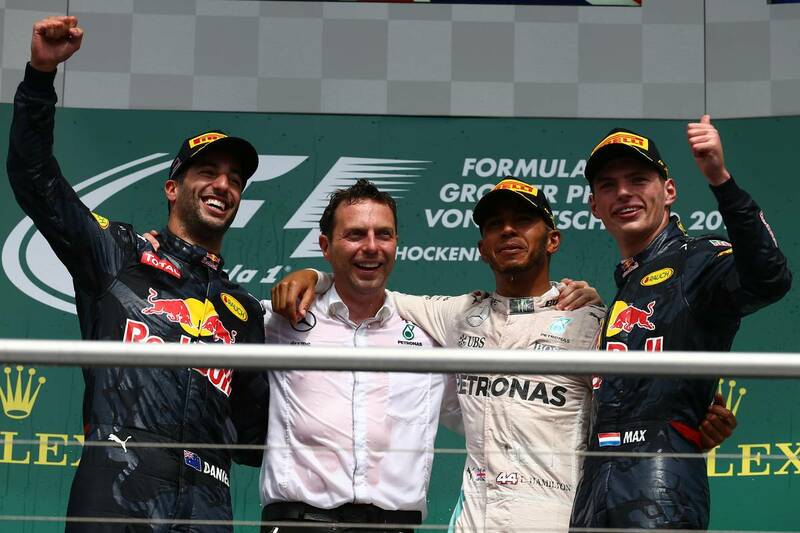 1st place Lewis Hamilton, 2nd Daniel Ricciardo and 3rd place Max Verstappen. Anyway as for me I’ve had a great weekend. Audi Malaysia lent me an R8 for the drive to and from Singapore. As expected I really enjoyed it on the highways but what I was really surprised was how much fun this car was in the city. Over the bumps and potholes in KL it’s surprisingly a lot of fun. Hopefully I’ll have it next week too when I race at Sepang in the Audi R8 LMS Cup. Maybe it will bring me luck and I’ll be able to grab another win. Fingers crossed. 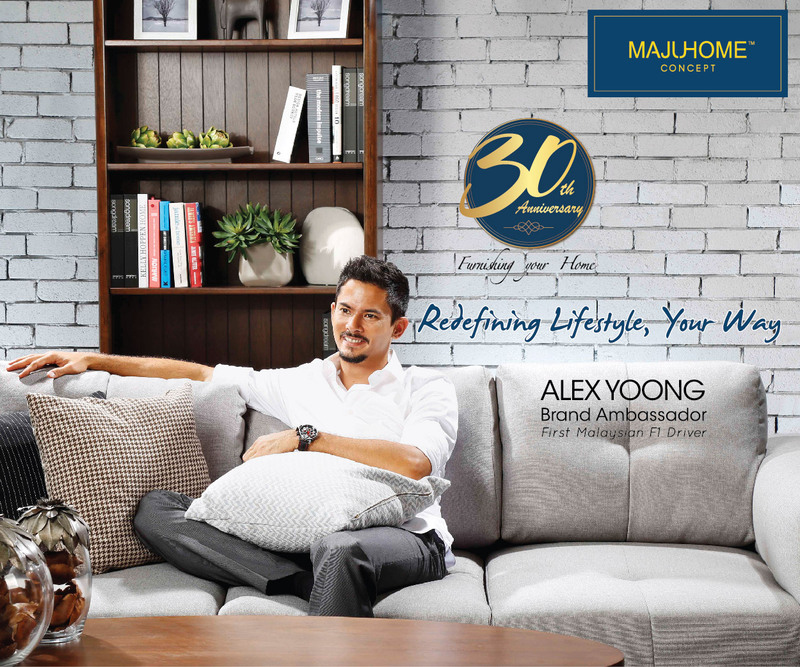 Alex will be defending his Audi R8 LMS Cup championship at the Sepang International Circuit on August 13-14. Entry is free. View all the off-track and on-track action from the German Grand Prix in the Pit Talk Asia F1 Top Shots Gallery.